Belle Epoque, or Beautiful Era, is a lovely little hidden gem of a novel. I absolutely love the author's gorgeous prose. It's clear that she researched the amazing time period of the 1880s very well, and she writes about it beautifully. I love the moral of the story, too: how beauty doesn't matter. I was afraid it might be cliché but it's actually quite touching. 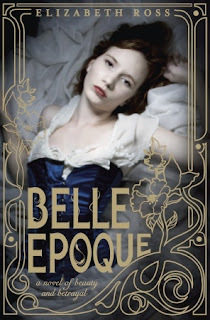 The story of Belle Epoque is so very original. I've never read anything like it. If you read the summary, you'll see it's about a girl who works at an agency where people can hire her, because she is considered plain, in order to make themselves look more beautiful. My heart broke for Maude as throughout the story she slowly loses all self-esteem. It's frightening to consider how damaging a job like hers is. I liked Maude as a main character fairly well. It's quite easy to sympathize with her plight, and her inner strength and determination is something I admire. Still, she had a few moments that tested my patience slightly. Her deception to her friend Isabelle seemed to continue too long - I wanted her to just be honest and realize that her friendship, not riches, was what mattered most. But that was all that bothered me, and I loved everything else about the book. The setting has to be my favorite part. I'm obsessed with France - I took two years of French, I love the fashion there and learning about the culture, and I'm dying to visit Paris one day. So I was completely in love with the descriptions of Paris. This time period is so important to the story too; as this is the year the Eiffel Tower was being built. It plays such an interesting part in the story. Ross has perfectly captured the culture of France. There's a wonderful slew of minor characters I loved. Like Isabelle, who seems like a snob at first but has surprising depth. And Paul, the kindhearted love interest. (Can I also point out that this book is a great example of romance playing a side role in the story, while leaving plenty of room for the actual plot to develop.) Lastly there was Marie-Josee, the sweet girl who tried her best to help Maude and was there for her no matter what. If you are a fan of historical fiction or of Paris, then you definitely have to pick up this thought-provoking book. Even if historical fiction's not your thing, I'd still recommend giving it a try! It's a wonderful book. "'You possess it,' he says. 'Possess what?' I ask, hoping what follows is a compliment. 'You have the capacity to be moved by art, to be affected by beauty.'"